Moving like a herd of turtles in a pot of glue, we departed from camp on the later side today at 9 am to make our way across the Shira Plateau (one of the world’s highest) to our next camp at Shira 2. The Lemosho Route is designed for gradual acclimatization, so the vertical gain today was a modest 350 meters. 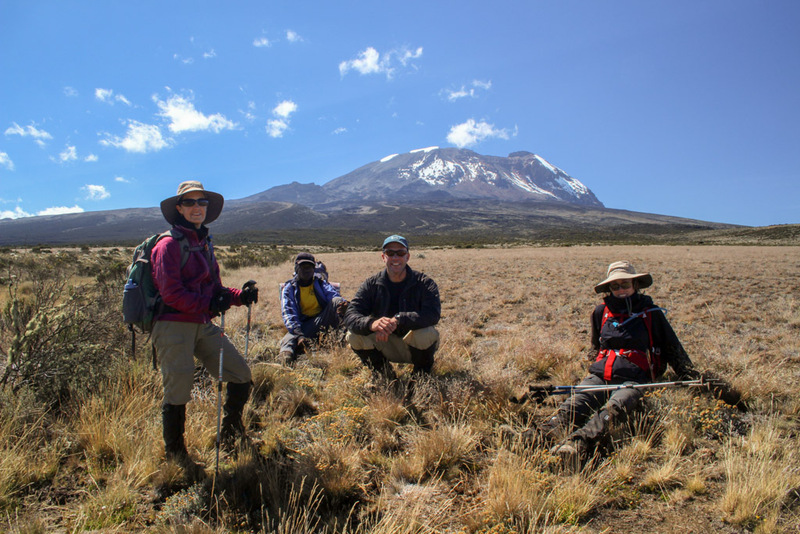 We savored the gentle ascent across the open plateau, which resembled the desert country of Arizona and Southern California and kept us in full view of Kilimanjaro all day long. As a bonus we took a detour to hike up to the Shira Cathedral, a spiny rock ridge that rises prominently above the plane. We scrambled up to the top and walked along the ridge to a stunning 360 degree view of Mt. Meru, Mt. Kilimanjaro and the Usambara Mountains further off in the distance. There we enjoyed a lunch break as we watched the ever-changing clouds and sun play across the mountains—a truly magnificent scene. A few more hours of trekking took us up to camp. Shira 2 has more protection from the wind and is slightly more put together due to its proximity to an emergency access road. Mussa continues to feed us well: freshly-made chapati and soup, rice and green beans with now-familiar vegetable curry sauce, fruit and tea, all served by candlelight using a potato as a base…very romantic! Thanks for following along, Norway buddy. That’s especially meaningful coming from a fellow traveler!